The Next 50 could shape your life. The Next 50 features a keynote and two panel discussions where practitioners and visionaries will share their views on a variety of topics. Sudhir is an author and political commentator who brings a fresh perspective to issues. His first book, Floating On A Malayan Breeze: Travels In Malaysia And Singapore (2012), explores the relationship between neighbours and rivals, Singapore and Malaysia. His second book, Hard Choices: Challenging The Singapore Consensus (2014), is a collection of essays co-authored with Donald Low. Sudhir used to be part of The Economist Group in Singapore. His keynote will explore the impact of economic, societal and political issues on the future of Singapore and the region in terms of community and business engagements. We investigate how the future will be shaped by today’s technology. How will we live, work and play? How will we be entertained, where will our sources of food come from, what factors will shape the identity of Singapore in a globally mobile world? Dr Barry Kluner, Chiropractor, Backjoy. Dr Barry trained in Canada and practices at the Spinal Joint Posture & Spine Care Centre in Malaysia. He is a regular contributor to periodicals and journals on spinal health. 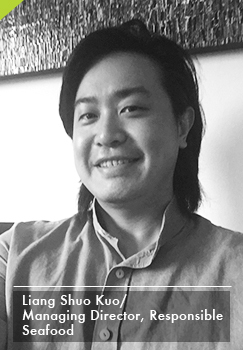 Liang Shuo Kuo, Managing Director, Responsible Seafood. Shuo is a marine biologist who understands firsthand the plight of the underwater community. By adopting responsible practices he believes food sources can be sustainable over generations, though swift action is required. Grace Sai, CEO and Co-Founder, The Hub Singapore. Grace is interested in ecosystem building and policy development for startups and social enterprises. How prepared are we for the journey into tomorrow? Are our institutions and systems set up for the next 50 years of progress? How well will we cope with urbanisation, ageing populations and disruptive technologies that will shape and reshape the future. 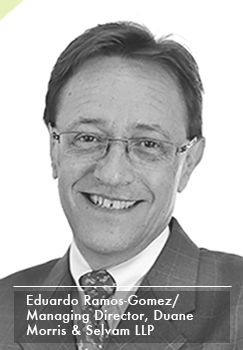 Eduardo Ramos-Gomez, Managing Director, Duane Morris & Selvam LLP. Ambassador Ramos-Gomez is a lawyer who used to be Mexico’s ambassador to Singapore. He has practiced international and corporate law for more than 30 years. Dr Derek da Cunha, Independent Scholar and political commentator. Dr da Cunha is a respected commentator in the fields of politics, defence, elections and casinos. His critiques are well regarded among circles of influence. Haresh Khoobchandani, GM Business Solutions, Asia Pacific, Microsoft. Haresh is a senior leader with over 23 years of experience building and leading multicultural teams across Asia throughout Sales and Marketing disciplines in regional and subsidiary roles. STORM magazine brings them together from near and far to share their insights and views. You never can tell what nuggets of information you could pick up. Be part of the discussions that will help define the future in Keep It Going: The Next 50. How will we be entertained, where will our sources of food come from, what factors will shape the identity of a globally mobile world? 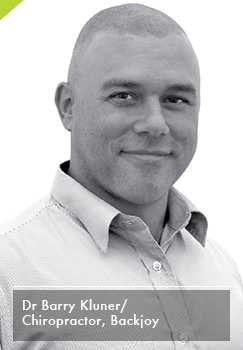 Dr Barry Kluner is a licensed Doctor of Chiropractic from Canada. He blends the concepts of chiropractic care and beyond with unique core-fitness programs designed to help patients correct and protect their spine and posture. Practicing in Malaysia since 2001, he has played an integral role in introducing the benefits of better posture for a healthy spine with Chiropractic. Specializing in spine and posture restoration, he is recognized as one of the most dynamic posture specialists in the region. Aside from clinical practice, Barry provides his expertise as part of the BackJoy product design and development team, writes regularly for regional newspapers and fitness magazines. He travels regularly through Asia-Pacific regions providing fun and interactive seminars on the benefits of good posture for a healthy life. Liang Shuo Kuo, Managing Director, Responsible Seafood. A former national sailor and marine biologist, Liang Shuo Kuo is passionate about the sea. A marine biology and ecology graduate of the Melbourne University, Shuo spent time working for the Australian government as part of the Department of Primary Industries, where he researched on Environmental Impact Assessments. He followed this up as a regional consultant in the field, working at the Shanghai Ocean Aquarium and the Resorts World S.E.A. Aquarium. He started Responsible Seafood in 2013 with the intention of developing a more sustainable mindset among consumers for the rapidly depleting seafood resources. 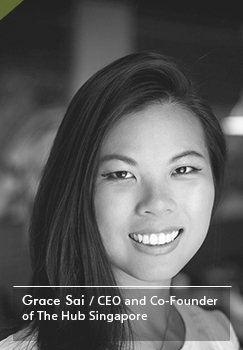 Grace Sai is the CEO and Co-Founder of The Hub Singapore, Singapore’s largest co-working community of entrepreneurs, creatives and techies. Regarded as the node of entrepreneurship ecosystem in Asia, she is interested in ecosystem building and policy development for startups and social enterprises and has been invited by the Prime Minister’s Offices in Singapore and Malaysia, Angela Merkel, Mayor Park, amongst others; to share her inputs. Grace has been nominated as a Young Global Leader, World Economic Forum (2013) and is a UN Women Entrepreneurship Day Ambassador. A Social entrepreneur-in-Residence at INSEAD and a TEDx Singapore speaker, she has delivered Entrepreneurship courses in universities and is a well-known speaker at international conferences. How prepared are we for the journey into tomorrow? Are our institutions and systems set up for the next 50 years of progress? Eduardo Ramos-Gómez is a Managing Partner of Duane Morris’ Asian offices in Hanoi, Ho Chi Minh City and Singapore. He has practiced international and corporate law for more than 30 years, advising multinational and foreign companies in Asia, North America, Europe and Latin America on cross-border direct foreign investment, project development and project finance. His practice encompasses a broad range of international investments, mergers and acquisitions, securities, financing, joint ventures, licensing, venture capital formation and investments, privatization, infrastructure projects and other corporate transactions in the United States, Latin America and Asia. In 2014, he was the recipient of the Buen Vecino Award from the United States-Mexico Chamber of Commerce which honors public and private sector leaders for their vision and commitment to mutually beneficial relations between Mexico and the United States. Dr Derek de Cunha is an independent researcher with a wide range of research interests from electoral politics to defence and security, to the collection of Chines Works of Art. He has a Phd in International Relations from the Australian National University and was a Senior Fellow at the Institute of Southeast Asian Studies from 1990 to 2006. He has written and edited many books. His single-authored books include: Breakthrough: Roadmap for Singapore’s Political Future (2012); Singapore Paces its Bets (2010) which was a book on the socioeconomic impact of the entry of casinos into Singapore; and The Price of Victory: The 1997 Singapore General Election and Beyond (1997). Haresh Khoobchandani is the general manager of Microsoft Business Solutions for Asia Pacific, based in Singapore. 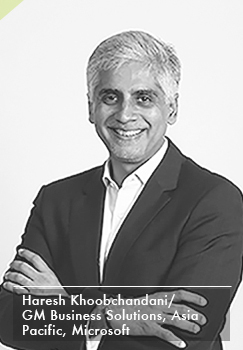 With more than 20 years of experience at Microsoft, Haresh brings unique depth and breadth of regional expertise across both Sales and Marketing disciplines to drive expansion in Asia Pacific. He is also a distinguished public speaker and commentator, with engagements including “Redefining Education in the 21st Century” at TEDxChiang Mai, the Bloomberg ASEAN Business Summit in Bangkok, the Harvard College in Asia Programme, and the Bloomberg special “Thailand: Inspiring Opportunities”. In recognition of his thought leadership in marketing, he was awarded the Global Brand Leadership Award at the World Brand Congress 2011. The impact of economic, societal and political issues on the future of Singapore and the region in terms of community and business engagements. 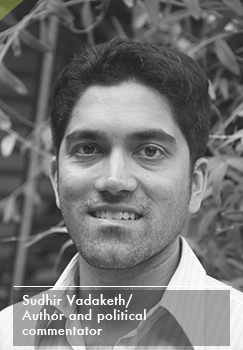 Sudhir Vadaketh is an author and political commentator who brings a fresh perspective to issues. His first book, Floating on a Malayan Breeze: Travels in Malaysia and Singapore (2012) explores the relationship between neighbours and rivals, Singapore and Malaysia. His second book, Hard Choices: Challenging the Singapore Consensus (2014) is a collection of essays, co-authored with Donald Low. 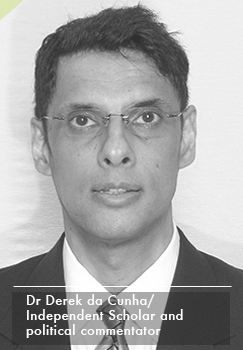 Sudhir used to be part of The Economist Group in Singapore.